One look at this spectacular cover, and you'll totally 'get' my rabidly beating heart, even if you suffer the misfortune of never having laid eyes on a Marc Martin book. If you have indeed experienced his work before, then you'll no doubt already have Lots in hand, as you read this. And aren't you a lucky soul? It's so happy-making to follow the careers of children's book talent, and my favourite creators are often those who change things up, who grow and develop their work, and try new things. Marc Martin does just this, and the Lots experience certainly gave me lots to be happy about. 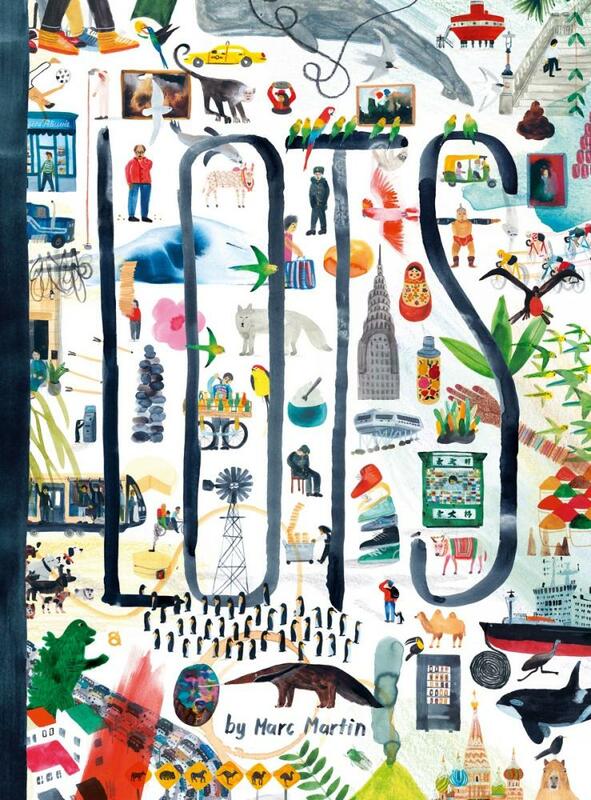 This tall, matte-paged book takes us on a journey to lots of different places, and shows us lots of wonderful things about said places. Beginning with Antarctica and its stacks of whales, penguins, icebergs and shipping containers, we move straight from ice to the red desert heat of Alice Springs and its lots of roos, budgies, emus and breathtaking iconic geological sites. We also visit Hong Kong and its lots of buildings and ferries and expensive cars, then Tokyo and its lots of people and vending machines, and then on through Ulaanbaatar, New Delhi, Moscow, Cairo, Paris, Reykjavik, New York City, Galapagos Islands, Amazon Rainforest, Rio de Janeiro, and Cape Town. What I really love is that there's no rhyme nor reason to Marc's places of choice--he's shunned the 'typical', expected line-up of world hotspots and instead created spreads on whatever appeals to him--what calls to him. The Amazon Rainforest and Ulaanbaatar coupled with Paris and New York City? Why not? It's as it should be. I feel it's a mistake for readers expect books to be what THEY want them to be, as opposed to the creative impulse of the book's creator, so this book delighted me in that way. 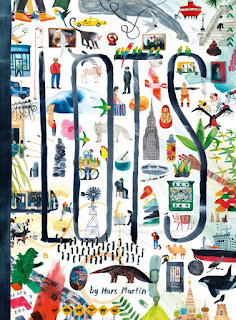 I love this book for its creator content but also for its attention to detail and its Folksy-modern style illustrations--lustrous in their scope and colour palette. Ultra-busy double-page-spreads will absolutely delight readers of all ages, sweeping them inside another place, with cultural, geographical, floral and faunal enchantment at every turn. Comments and arrows lend added description, explanation and the odd smile-inducing observation. Please make Lots II. And than after that, please make Lots III.